The Smart Stencil Rack is 29” long by 23.45” wide, and 68” tall. It can hold two rows of stencils. Each row can be configured for 12 smart locations for standard-width stencils, or 32 smart locations for space-saver stencils. The product is designed to RoHS specifications and minimizes space and material usage in its construction. Each smart location has a sensor to detect when stencils are placed or removed, as well as an LED to indicate where stencils are located, and provide feedback when adding reels. To add a stencil to the rack, the customer either scans or enters the stencil part number and adds the stencil to any available location. The Smart Stencil Rack detects where the stencil was placed, and stores this for future retrieval. When a stencil is required for a job, the customer can browse for the correct stencil number(s) or import a pick list containing the required stencil part number(s). The stencil requirement can also be sent automatically through Inovaxe’s flexible API. The Smart Stencil Rack will illuminate the location(s) of the required stencil(s) and the customer can simply remove the stencil(s) at the indicated location(s). If an incorrect stencil is removed, the picking process is shut down and the Smart Stencil Rack indicates that an unauthorized pick has occurred. It also allows manufacturers reduce the need for paper pick sheets, and paper reports. 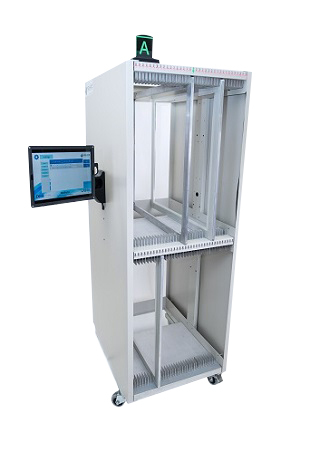 The InoAuto Smart Stencil Rack has been designed to increase the speed of storing and retrieving solder stencils. Each stencil can be stored or retrieved in under 10 seconds. Operators do not have to spend time searching for the correct location to put their stencil away, as they simply place the stencil into any available slot. When retrieving stencils, we quickly light up the correct location, so the operator does not have to spend time searching for and verifying the location to pull from. The Smart Stencil Rack is also designed to decrease the space required to store stencils. Each slot is designed to perfectly fit the standard stencil sizes, eliminating any wasted space. 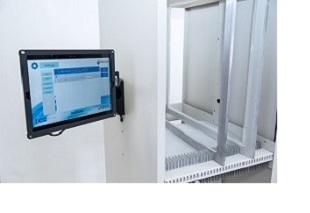 The InoAuto Smart Stencil Rack is compatible with Inovaxe’s InoAuto locator software, as well as with Inovaxe’s kit and stock management software, InoView. The Smart Stencil Rack can be used in conjunction with our other Smart Storage Solutions. Additionally, Inovaxe’s flexible API can be used to communicate with customer software, such as MRP, ERP, and MES.